A 2.6m long one-off custom design created for the Adidas’ pavilion at the 2010 Sónar Festival by beanbag manufacturers Woouf! It never went into production, denying us all the opportunity to make the Kessel Run in less than 12 parsecs in the comfort of our own homes. 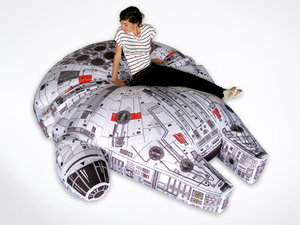 Posted in Misc and tagged beanbag, millennium falcon at 9:02 am on June 28, 2011 by Broadsheet.